Trying to mix it up a wee bit, I trekked across the lane to snap today's photo in the easement behind my neighbor's house. Granted, it will never be as awesome as the magical place where The Clothes Horse takes her photos, (um, because check out the trash by my boots) but it was a nice change from standing by my wood fence or in front of my planting boxes, right? Well, maybe not. It kinda smelled like dog poop over there and I tripped on an abandoned tire, almost dropping my tripod and camera and bag. I tripped so hard that my neighbor came out to see what the ruckus was. Oops! I'm okay, neighbor! The bottom two photos crack me up, so I thought I would share them. I was so sleepy this morning that I did not bring my A- game for my daily snaps (this maybe explains the colossal trip over the tire, actually!). In the photo on the left, I seriously think I'm telling the self-timer on the camera to give me a second. In the photo on the right, I'm wondering out loud if the wind is going to keep my new bangs intact. 1. That sunflower grew right under my bird feeder. 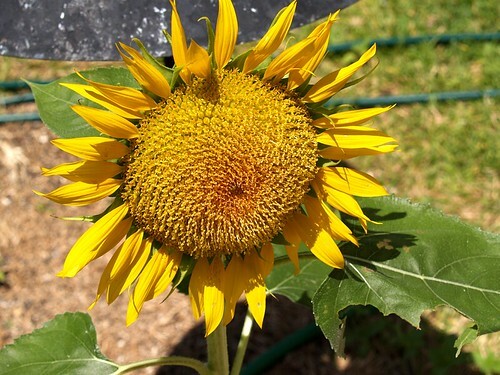 Every day Hubs and I feed our cardinal families a half gallon of black oil sunflower seeds, and each autumn a beautiful, proud sunflower blooms. 2. This dress was purchased at Savers, but it used to belong to one of my very best friends! I saw it at Savers, and I passed it up because it was a teensy bit too big, but then I regretted it non-stop for the next 48 hours. I finally called my friend Melissa to see if she wanted to go thrifting with me (and subsequently back to Savers so I could save that dress) and she was like, "Yes! I just donated some stuff to Savers so I have a 20% off coupon." We got there, and I started flipping furiously through the dresses. Much to my delight, this dress was still there. I showed it to Melissa and she started laughing and exclaimed, "Oh my gosh! I donated that dress last week. If I would have known you would have liked it, I would have just given it to you!" Oh, well. I still think this chiffon number was worth the money. It fits just right with a belt.